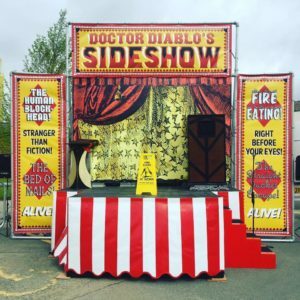 Dr Diablo has been performing sideshow feats since he was a teenager after a keen interest developed into a career. He is now one of the forefront performers in this industry and is known extensively in the bizarre world for his talent and knowledge. Ultimately professional and 100% authentic traditional performer- don’t settle for anything less. 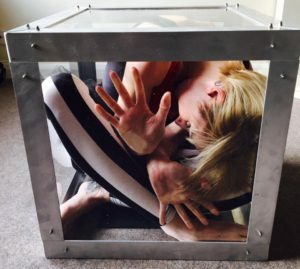 This show is performed at festivals, town centres and almost anywhere. The show comes self contained. Space required for the pop up stage is 5 metres across and 3 metres deep and 4 metres high. The transit van the show comes in needs to be parked behind the show as it powers the show and also store the props and acts as a changing room. So this can be placed in the middle of a field and you would need to think about to provide power. Space in front is required for an audience. 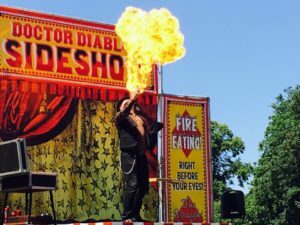 Typically Doctor Diablo would perform 3 x 30 minute shows with his assistant. This is a family friendly show but has a clear ‘PLEASE NOT TRY THIS AT HOME WARNING SIGN’. This show is mesmerising, captivating, weird, wacky, shocking but very exciting. This works well as part of a circus themed event.